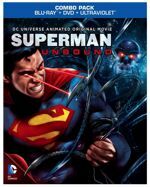 A destructive force is devastating planets across the galaxy - with Earth next in its sights - and even Superman may not be capable of halting the destruction alone in Superman: Unbound, the next entry in the ongoing series of DC Universe Animated Original Movies. Based on the Geoff Johns/Gary Frank 2008 release Superman: Brainiac, the film's stellar voicecast is led by Matt Bomer (White Collar) as Superman, John Noble (Fringe, The Lord of the Rings films) as Brainiac, Stana Katic (Castle) as Lois Lane, and Molly Quinn (Castle) as Supergirl. Supervising producer James Tucker (Justice League, Batman: The Brave and the Bold) also directs the film from a script by Bob Goodman (Warehouse 13, Batman: The Dark Knight Returns). Superman: Unbound is produced by Warner Bros. Animation, DC Entertainment and Warner Bros. Home Entertainment. The film will be released on Blu-ray, DVD, OnDemand and For Download in late Spring 2013.